James A. Martin was an amateur microscope slide-maker, mounting between approximately 1890 into the early 1900s. Very few published records have been identified with regards to Martin’s microscopy activities. We do know from a published report that, in 1894, he was the Secretary of the Guildford Natural History and Microscopical Society. That report further stated that on the night of January 24 of that year, Martin presented a talk on, “Wonders of the insect world, as revealed by the microscope…Illustrated, with the aid of the Oxy-Hydrogen Light, by 140 original Photo-micrographs and Drawings. The lecturer introduced his subject by explaining that most of the slides which he was about to exhibit had been taken by himself, direct from the natural objects, by means of the microscope”. Thus, Martin was reasonably competent with entomology, photography and sketching, as well as slide-making. Three different addresses are given on Martin’s labels (Figure 1), and can be dated through comparisons with census and other records. Martin lived in Guildford, Surrey between the mid-1870s and approximately 1910. Judging from his occupations, as described in census records, James probably could not have afforded custom-printed slide labels until 1890 or so. Those records give further refinement to dating Martin’s slides: he lived at Church Road, Guildford in 1891, which is an address printed on some slides, but had moved to Woodbridge Road, Guildford by 1901. Slides with labels that state only “Guildford” may date from after the move from Church Road. By 1910, Martin was living at Stamford House, Knaphill (Knapp Hill) in Woking, Surrey, but moved to another location in Knaphill by 1913. Figure 1. 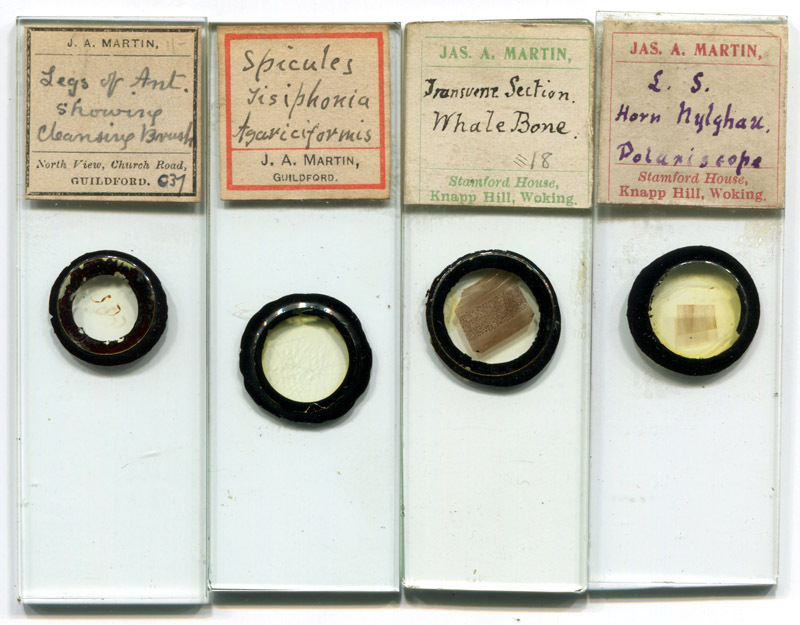 Examples of microscope slides prepared by James A. Martin. James Alexander Martin was born in Ewhurst, Surrey, England in 1860, and baptised in the parish church that May 30th. He was the fourth child, and only son, of James and Jane Martin. The following year’s census indicates that the father had a good-sized farm, cultivating 126 acres and employed 8 men. Some crisis appears to have hit the family, as the 1871 census records the father as being an “agricultural laborer” (i.e. farm hand), working in Merrow, Surrey. James Sr. died in 1878, at the age of 59. The 1881 census shows James Jr. living with his mother in Guildford, Surrey. He was then employed as a “grocer’s shopman”. It is likely that he learned bookkeeping as part of that job, for future censuses all record Martin as being an accountant. James married Alice Young in Guildford, in the summer of 1886. They had seven children together. The Martin household does not appear to have been overly comfortable – there are no records of them having domestic servants. Alice was recorded by the 1891 census as working as a music teacher, despite having three small children. The 1891 census also places the Martin’s home at Church Road. This corresponds to an address seen on some Martin slides (see Bracegirdle). However, the 1901 census reports that the Martins had moved in the intervening years, to Rutland House, Woodbridge Road, Guildford. The 1910 Transactions of the South-Eastern Union of Scientific Societies records the address of member J.A. Martin as Knaphill, Woking. The 1911 census provides the more precise address of Stamford House, Knaphill. This address is found on the most frequently seen Martin slides (Fig. 1). The Martins do not appear to have remained at that home for long, since a 1913 directory of Surrey reports them as living at Tapsell Hurst, High Street, Woking. I am not aware of slide labels with that address, suggesting that either Martin ceased to make slides around that time, or used non-personalized labels. He appears to have remained at that location until his death in 1939. Many thanks to Steve Gill for assistance with tracking down historical records.